HOPE Initiative as a Center Of Excellence seeks to be a central hub that acts as a think tank and knowledge center in the areas of Hepatitis B, Hepatitis C and Diabetes. We have developed a knowledge base and created various models of intervention strategies which are replicable, robust and scalable. The hub plays a strong role as a technical resource center for other organizations intending to work on similar interventions. Research Cell: The research cell undertakes field research on the magnitude of the health problems, unmet needs, specific areas and scopes for innovative school based programs, monitoring of programs, and impact evaluation on a continuous basis. Creative Cell: The creative cell is the innovative think tank which designs a wide range of innovative programs for different sections of school students of varying backgrounds. The programs and tools are so designed that children may take them home and engage their family on the subject, an aspect of particular importance to students from rural or lower socio-economic backgrounds whose parents are often not literate. Thus the cell is responsible for development of various types of teaching learning materials, books, BCC aids and allied materials. Field Operation Cell: This is essentially a field based cell responsible for providing various types of training, orientation and technical support. It is also be responsible for liaisoning with the government for seeking permission and linkages for public private partnerships. National Advocacy Cell: To interact with, take inputs from, and pass on the program to other interested organizations (other BMSF grantees) in a manner that can be adapted to their local needs, there would be a national advocacy and networking cell. If you seek to be a part of our Centre of Excellence or would like to collaborate with us to share our knowledge base, please click here. 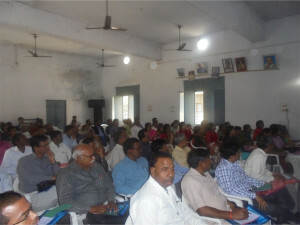 Training is being imparted on the 10 core topics of health as outlined by the book: Sanitation and Hygiene, Nourishment and Health, Hepatitis, Mosquito – borne and Lifestyle Diseases, Global Warming, Road Safety, Examination Stress, Bullying in Schools, Tobacco Alcohol and Drug Abuse and Festivals. 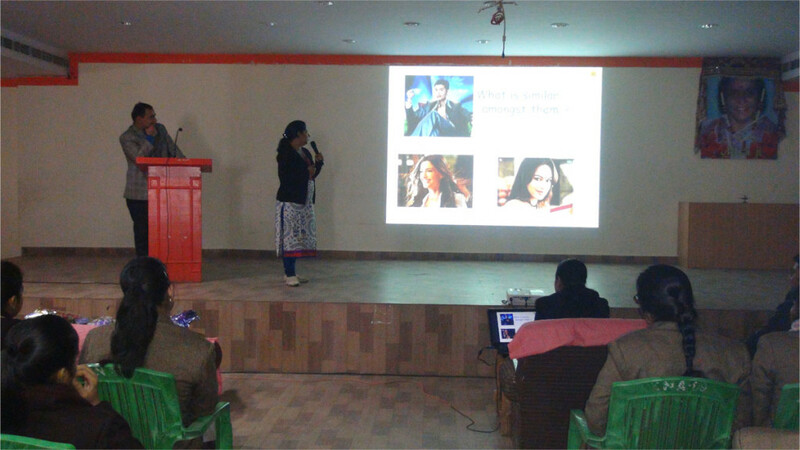 The training is conducted using various tools like screening of documentaries and movies, educational games, flip charts, presentations as well as counseling sessions. 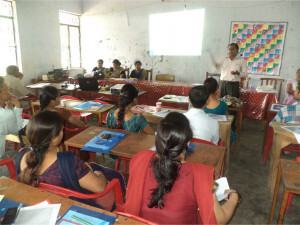 “Training the teachers” is an integral part of our Centre of Excellence project. HOPE initiative has received immense support from Directorate of Secondary Education, Uttar Pradesh, Lucknow for its health awareness training programs. 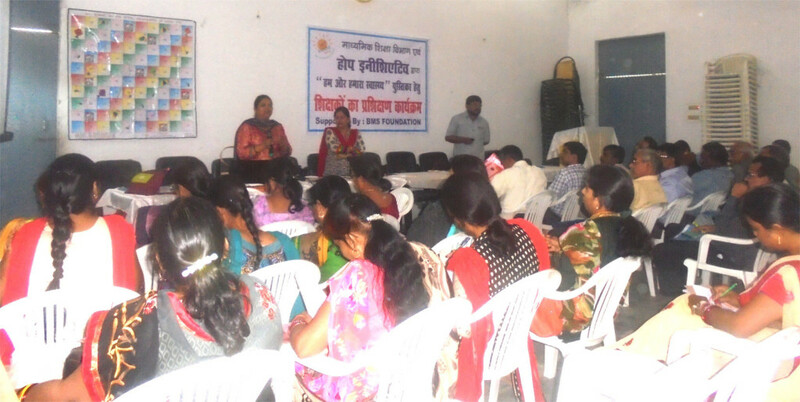 Teachers training has been successfully conducted in 45 Districts of U.P captured around 12,000 Government, aided and un-aided schools. Health Book “ Hum aur Hamara Swasthya “ prepared by HOPE Initiative with the collaboration of Directorate of Secondary Education has been distributed among Master trainers. 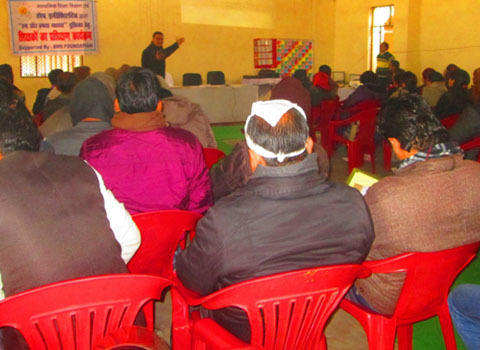 Topic covered during the trainings include-Hepatitis, Sanitation & Hygiene, Examination stress, Ragging & Bullying, Drugs, Alcohol & Tobacco, Life Style Disorders, Road Traffic Accidents, Global warming, Mosquito menace & Safe and Healthy festivals. 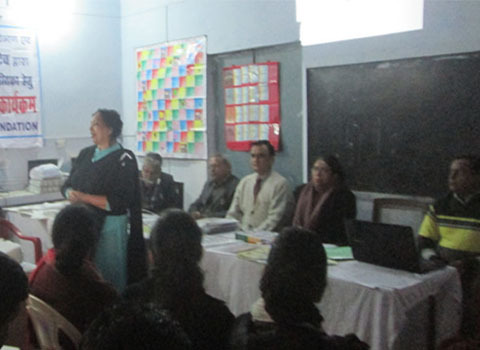 Various training techniques have been used by HOPE team members to impart knowledge on the various health topics to be covered by HOPE. These include presentations, short movies, story flexes, flash cards and educational games etc. 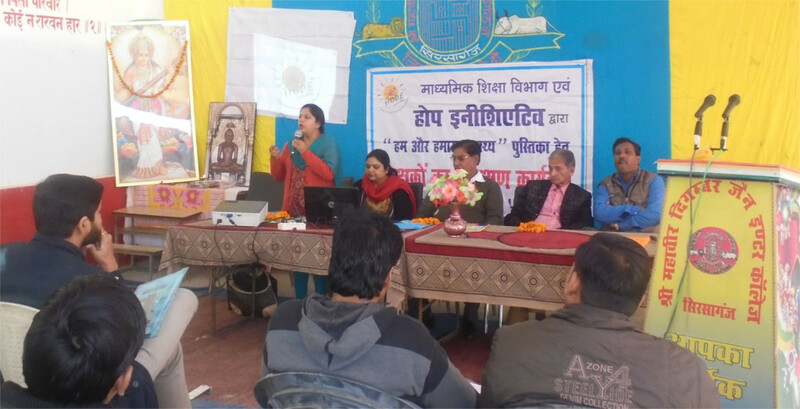 The first ever Training of Teacher program and the School workshops were conducted at Patna, Bihar on 17th – 18th December, 2015. 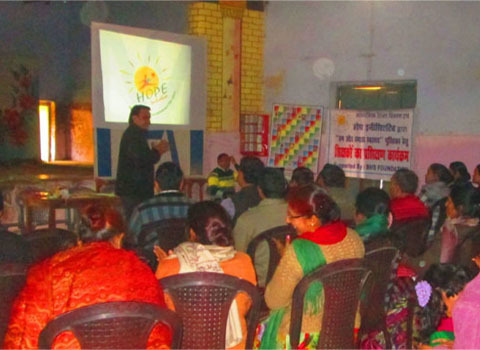 HOPE team trained 120 teachers from 2 different schools, namely Acharya Shri Sudarshan Patna Central School and Krishna Central School. 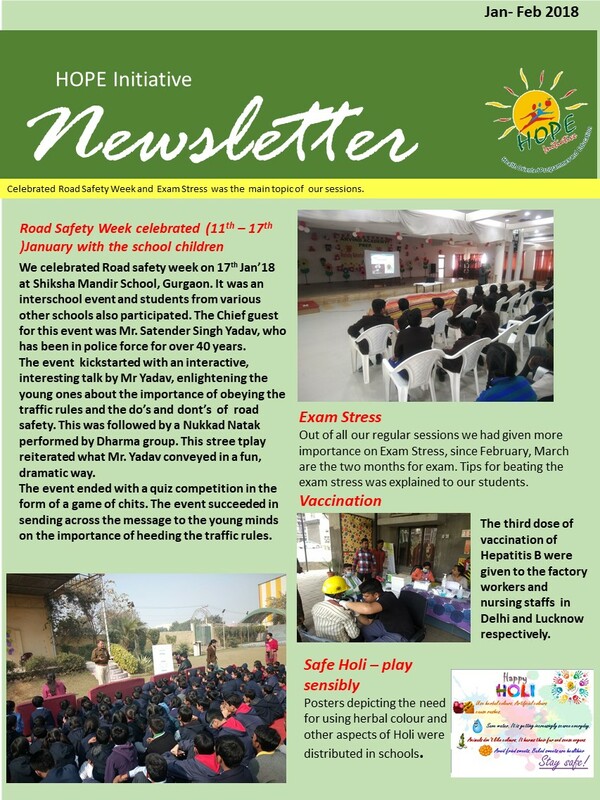 The health awareness topics were covered extensively through documentaries, interactive games and presentations. The entire event was extremely productive with frequent audience interactions and participations. The participating teachers showed great enthusiasm in grasping the topics presented and different methods of delivering the same to their students. we also conducted our usual HOPE programs such as Good and Bad Touch, Exam Stress, Bullying and Ragging, hand wash, personal hygiene etc, which were attended by around 1500 students in the course of 2 days. 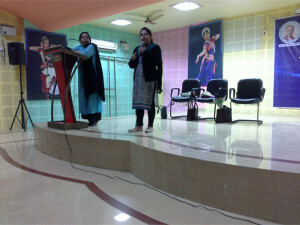 This was done through screening of Movie, PPT, holding interactive discussion and using other interesting Interventions.